When you're looking for the perfect car to go on an adventure and explore the world, the 2016 Hyundai Santa Fe is the perfect car you'll need. Come to Jim Burke Hyundai to check out the 2016 Santa Fe! Located at 1424 5th Avenue North, Birmingham, AL Jim Burke Hyundai serves Hoover, Tuscaloosa, Talladega, and Jefferson County. The 2016 Hyundai Santa Fe has more to offer than the Nissan Rogue! The MSRP of the of the 2016 Hyundai Santa Fe is $28,960 while the MSRP of the Nissan Rogue is $29,890! Interior features that are standard or option depending on the models include a Panoramic sunroof, Air conditioning, Dual Automatic temperature control, Power windows with driver's auto-down, Power door locks, Power driver seat with power lumbar support, premium cloth seating, leather seating surfaces, heated front and rear seats, 50/50 split-folding 3rd-row bench seat, Premium instrument panel and driver's side panel, 2nd-row air conditioning vents, 3rd-row climate control and vents, Dual illuminated vanity mirrors, 12-volt power outlet, 115-volt power outlet, Leather-wrapped steering wheel and shift knob tilt steering wheel, Blue tooth hands free phone system, 7-passenger seating. Blue Link Telematics System, AM/FM/Sirius/XM audio system with six speakers, 4.3- inch color touchscreen audio display with rearview camera, 8-inch navigation system with high-resolution display and rearview camera. The Nissan Rogue offers cruise control, front / side airbags, cruise control, child safety locks, alloy wheels, four speakers with AM/FM radio, and air conditioning. 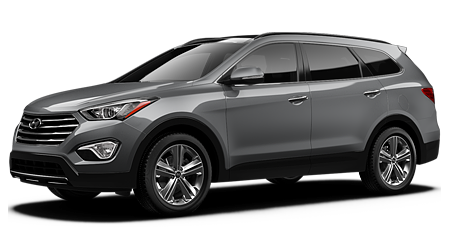 The 2016 Hyundai Santa FE comes with a 10-year/ 100,000 Mile powertrain warranty. Other warranties include a 5-year/ 60,000 Mile New Vehicle Limited Warranty, 7-year / unlimited Miles Anti-perforation Warranty, and a 5-year/ unlimited miles 24-hour roadside assistance. 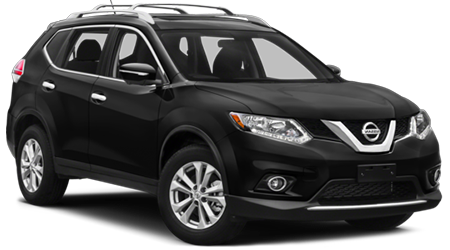 The Nissan Rogue offers a 3 year / 36000 basic warranty, a 5-year/ 60,000 drivetrain warranty, and a 3 year/ 36,000 roadside warranty. The best car to go on an adventure with is the 2016 Hyundai Santa Fe. Jim Burke Hyundai can assist you today in owning the car of your dreams to take to the wild!